Tap the Music button on the Kindle Fire HD’s Home screen. Locate an item you want to play on a tab in the Music library, such as Songs or Artists. If you open a tab other than Songs, you need to tap to open an album or playlist to view the contents. Tap to play the song. 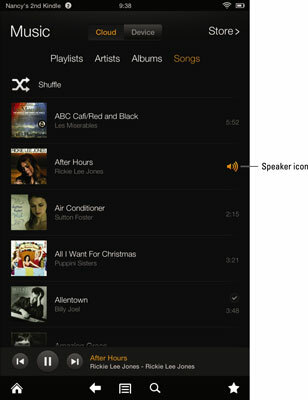 If you tap the first song in a group of music selections, such as an album or playlist, Kindle Fire HD begins to play all selections, starting with the one you tapped. 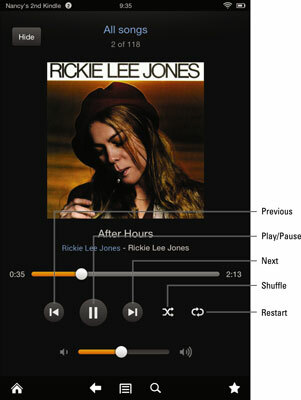 Use the controls shown to control playback. Tap the back-facing arrow on the Options bar or the Hide button in the top-left corner of a currently playing song to go back to the album or playlist the song belongs to. To go back to the Now Playing screen for the song, tap the information bar for the song that appears along the bottom of the screen. You can adjust playback volume by swiping down from the top of the Kindle Fire HD screen to reveal Quick Settings and then tapping Volume, or use the Volume setting in the Now Playing controls.